Scrape the scales of the fish and remove giblets. Add the salt, pepper, olive oil, the sliced onions, the celery and the sliced tomatoes in a saucepan and boil them. Strain the vegetables well and put them on a plate. Put the fish on the same water and boil them. After boiling them until cooked, strain them through a strainer, making sure the meat of the fish is well pressed in order all the fish juice to come out. Serve the soup hot with lemon. Serve the vegetables and the fish on a plate seperately. 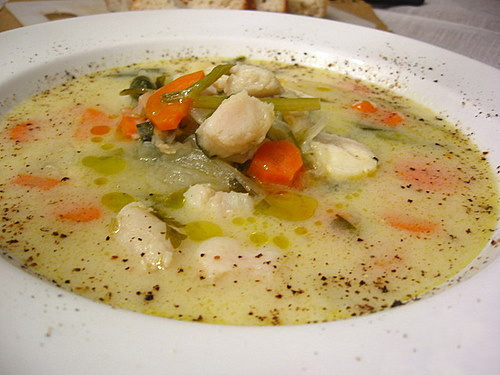 If you use a large variety of fish the fish soup will be more tasty.